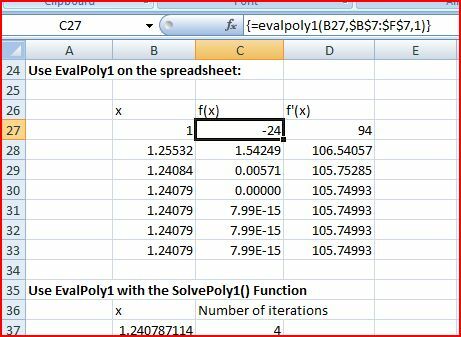 Following on from the previous post, this post presents a number of methods of solving polynomial equations using approximate iterative methods in Excel. Similar methods can be used to find solutions to any other equation that can be evaluated numerically. 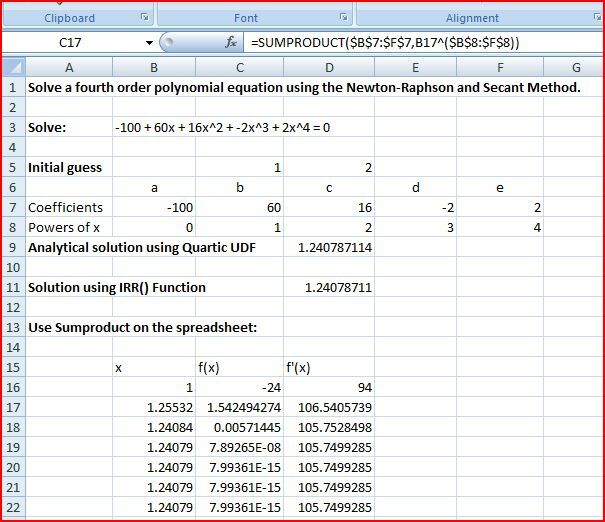 The example used is the evaluation of a quartic polynomial, for which exact analytical solutions are available, but the functions in the spreadsheet may be used directly for polynomials of any degree, and may be easily adapted for other forms of equation. 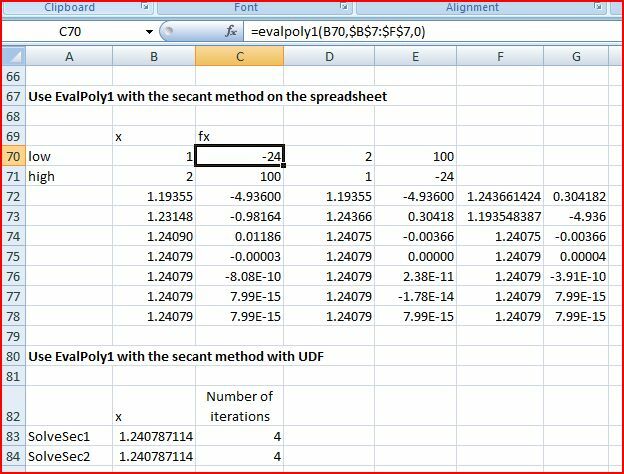 The spreadsheet also includes User Defined Functions (UDFs) to solve Quartic, Cubic and Quadratic equations. The basis of the Newton-Raphson (and related) methods is shown in the chart below. The value of the function, f(x), and its slope, f'(x), are evaluated at some estimated approximate solution value, x1. A better approximation, x2, is then given by x2 = x1 – f(x)/f'(x). Where the function coefficients are listed in ascending powers of x in the range B7:F7, and -0.2 is an initial guess of the IRR. Note that in this case an IRR value of -0.2 is equivalent to a solution value of 1/(1 – 0.2) = 1.25. These formulas may be simply copied down to give the required level of precision. This approach is incorporated in the UDF SolvePoly1(), which returns the solution to the equation, and the required number of iterations. The analytical solution is substantially quicker than any of the approximate methods, and is recommended where applicable. The secant methods are approximately the same speed as the Newton-Raphson method using analytical evaluation of the slope, and are of wider applicability. The solutions that check for intermediate solutions being within the specified bounds are slightly slower in this case, but for less well behaved functions will find solutions when the other methods may not converge. 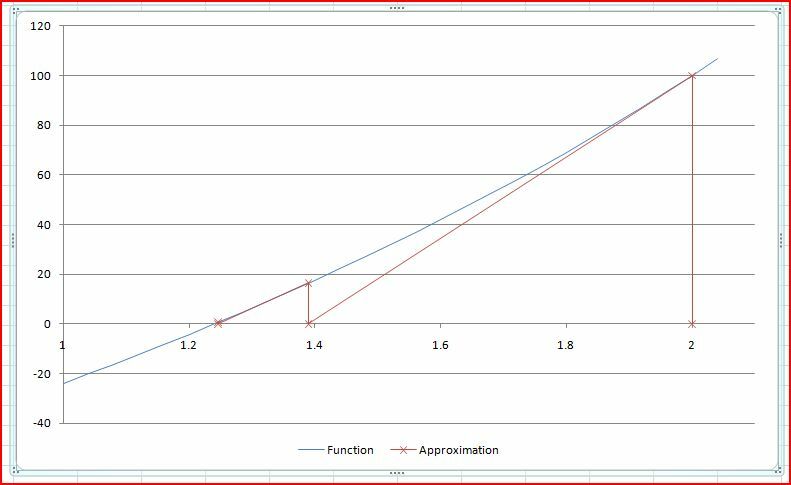 Evaluation of functions specified in text on the spreadsheet, using the Evaluate function, is very slow. Similar functionality with much better performance can be obtained by replacing the text function with a purpose written VBA function. 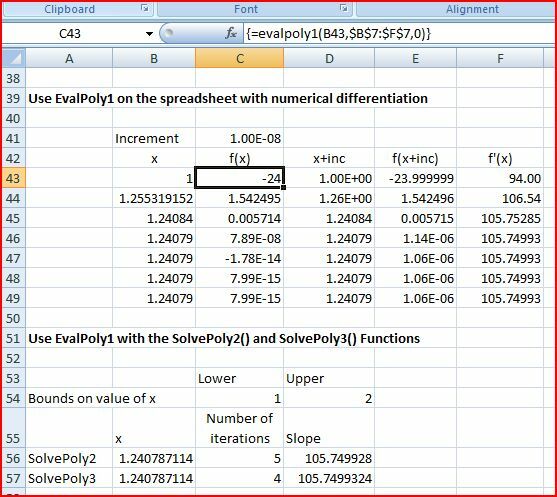 This entry was posted in Excel, Maths, Newton, UDFs, VBA and tagged Cubic, Excel, Newton-Raphson Method, Polynomial, Quartic, UDA, VBA. Bookmark the permalink.